Each species tend to specialise in different diet. 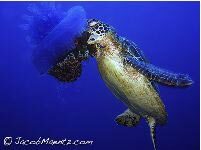 Sea turtles, especially green sea turtles, are one of the few animals that eat sea grass. 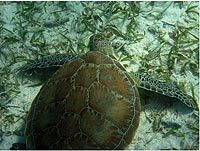 Sea turtles act as grazing animals that keep the sea grass short and help maintain the health of the sea grass beds. Sea grass beds provide breeding and developmental grounds for numerous species of fish, shellfish and crustaceans. Adult sea turtles have few predators, mostly large sharks. Although sea turtles cannot withdraw their heads into their shells, the adults are protected from predators by their shells, large size and thick scaly skin on their heads and necks. Tiger sharks, in particular, are known for eating sea turtles. Killer whales have been known to prey on leatherback turtles. 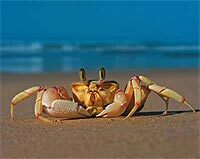 Fishes, dogs, seabirds, raccoons, crabs and flocks of gulls, and other predators prey on eggs and hatchlings. 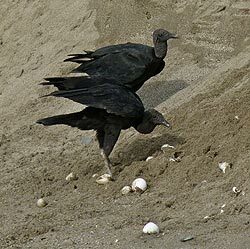 Most than 90% of hatchlings are eaten by these predators. Flatback turtle nests are susceptible to predation by monitor lizards, dingoes, and introduced foxes. Underwater Digital Camera Mask in Maui.